Definition: Stapel Scale is a unipolar (one adjective) rating scale designed to measure the respondent’s attitude towards the object or event. The scale is comprised of 10 categories ranging from –5 to +5 without any neutral point (zero). The stapel scale got its name after its developer Jan Stapel. The scale is usually constructed vertically with a single adjective in the middle of the range of values (-5 to +5). The respondent is asked to select the appropriate numerical response category that best describes the extent to which the adjective related to the object is accurate or inaccurate. The higher the positive score selected by the respondent, the more accurate the adjective describes the object and vice versa. 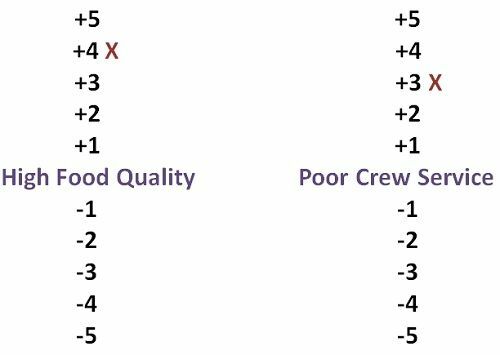 From the above example, the airline is evaluated as having a high food quality but somewhat a poor cabin crew service. The stapel scale is like a semantic differential scale with little modifications. It is often used in the situations when two bi-polar adjectives are difficult to find out. The data obtained are the interval and are analyzed in the same manner as the semantic differential data. One of the advantages of the stapel scale is that it does not require the pre-testing of adjectives to ensure their true bipolarity. Also, it can be easily administered over the telephone. But, however, some researcher finds the stapel scale to be quite complex and confusing.